CONCEPTACT*(Adaptive Concept of Thought – Rational) is a cognitive architecture. Cognition is the process of understanding or acquiring knowledge and information through thought, experiences and other senses. The architecture made with the framework or model which shows the process and understanding of acquiring knowledge and information. This theory tells us each and every tasks performed by the human beings are considered of several steps and processes. It provides a model or framework of these processes that happens in our mind, the framework or model may look like a programming language. The theory works on psychological assumptions of human nature which derived from numerous scientific experiences and experiments. Perceptual-Motor modules which take care of the inferences or interactions with real or outer world. This part acts as a gate to bringing in the necessary information and data for reaching at the models. a) Procedural memory consists of the knowledge that we uses to do simple things such as removing pen cap or opening car door. b) Declarative memory consists of information and facts like there are 24 hours in a day or 7 days makes a weak. c) Working memory is part of the long-term memory which more highly activated. 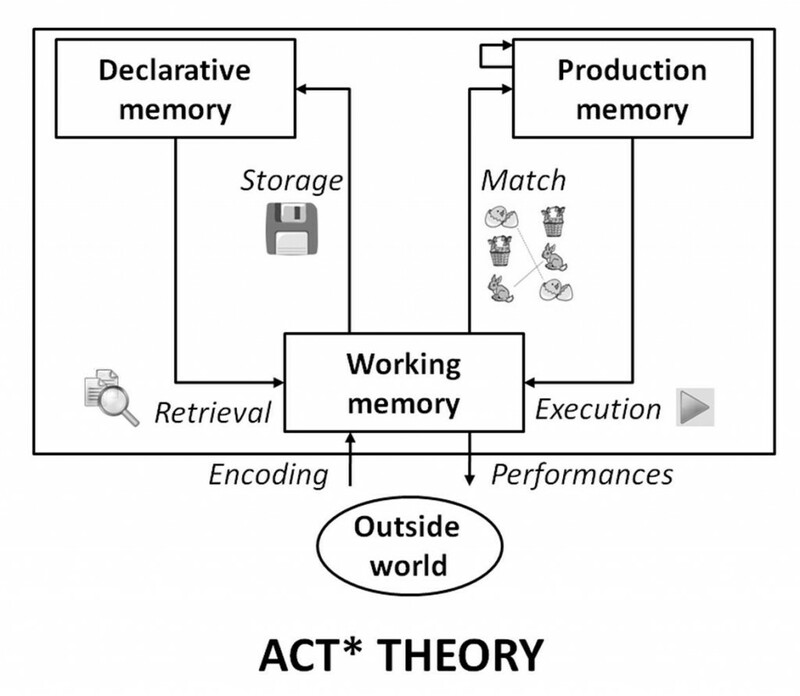 The picture shows how procedural and declarative memory works for performing each and every task. The theory finds out differences between procedural and declarative memory. In each module the information where brings in and taking out from one module to another module. These particular buffers systems provide the accessibility to cognitive adaptation thoughts through buffers. The pattern matcher seeks for a production that matches the current state of the buffers. Only one of these productions can be performed at a specific period of time. That production, when it is performed, can alter the buffers and thus changes are brought into the system. Thus, in ACT* cognition explains as a series of production and a model is made. The theories in cognitive sciences are divided into two the “symbolic” or the “connectionist”. The ACT* theory is considered as a symbolic one and it is classified as such in the books and collections because symbolic approaches describes mind as a product of brain, so as the ACT* theory. This theory can be used to evaluate the mental capability of the students in quantitative measures. The ability to solve mathematical problems to each student may vary. If we have the quantitative measurement that obtained from ACT* model of each students, we could categories them according to their abilities. If the pupils are classified according to their abilities, the teachers can give their attention accordingly. For finding the answer for the same question the pupil in the higher measurement classes can be given much less time than other pupils. And thus pupil with low measurement can be provided with more time than the time given to other pupil. please, i like to have some information concerning my project.